Aloha POS is a leading restaurant point-of-sale system that is designed to help users in all their operational requirements. It is a total solution that is bound to boost customer experience, improve service and management and ultimately grow your business using technology and equipment that are specifically designed for restaurants. This feature-rich point of sale solution was developed specifically for all types of dining establishments including casual dining, quick service, fast casual and fine dining. What Aloha POS does is enter orders and payments, enhance overall operations and accelerate the preparation of food and delivery without compromising the quality of the service. Aloha POS provides restaurant operators with the tools and features that encourage pace of service and generate more sales. 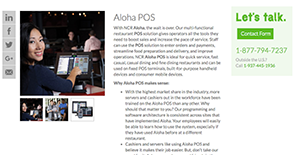 Aloha POS by NCR is branded as one of the most most innovative, cutting-edge POS software and hardware available for dining establishments. Aloha POS is a totally unified solution that integrates many aspects of restaurant management and covers various needs and processes, including fast and convenient ordering, mobile tableside ordering, as well as employee monitoring. Aloha POS is a very versatile software that can be tailored to suit changing business needs. As your restaurant grows, Aloha POS can be customized to adapt to your requirements, whether you need more fixed terminals or mobile handheld devices to address orders and more. Simplicity is also another highlight for Aloha POS, which is why it is one of the most used POS platforms by bartenders, servers and cashiers. Aloha POS is also designed to operate as an on-premise solution or as a cloud-hosted service. It also has theft detection feature that helps managers and owners spot and address employee theft and fraud in real time. It is essential to note that virtually no service in the POS Software category is going to be an ideal solution able to match all the goals of different company types, sizes and industries. It may be a good idea to read a few Aloha POS reviews first as certain software may perform well exclusively in a very narrow group of applications or be designed with a really specific industry in mind. Others might operate with an intention of being easy and intuitive and consequently lack complex functionalities desired by more experienced users. You can also come across solutions that cater to a large group of users and provide a rich feature toolbox, however this usually comes at a higher price of such a software. Ensure you're aware of your requirements so that you select a solution that provides specifically the elements you look for. How Much Does Aloha POS Cost? We realize that when you make a decision to buy Restaurant Management Software it’s important not only to see how experts evaluate it in their reviews, but also to find out if the real people and companies that buy it are actually satisfied with the product. That’s why we’ve created our behavior-based Customer Satisfaction Algorithm™ that gathers customer reviews, comments and Aloha POS reviews across a wide range of social media sites. The data is then presented in an easy to digest form showing how many people had positive and negative experience with Aloha POS. With that information at hand you should be equipped to make an informed buying decision that you won’t regret. What are Aloha POS pricing details? What integrations are available for Aloha POS? If you need more information about Aloha POS or you simply have a question let us know what you need and we’ll forward your request directly to the vendor.